The hearing to determine whether the player likeness lawsuit against the NCAA, CLC, and EA will become class action is now scheduled for June 20. In preparation for that major turning point a few pieces of news relating to the case have emerged. What could make it difficult for the case to be certified as class action is that each individual athlete values their worth differently. Imagine the variances in Heisman candidates, a starting player from a premier program, a starter from a lower-tier program, a backup on a high profile team, and so on who will all feel they are deserving of something different. This is evidenced by two depositions that are now profiled from former Alabama wide receiver Tyrone Prothro and UConn basketball guard Tate George and will support the attempts by the defendants to prevent this from becoming a class action case which would be a huge win for them. George’s and Prothro’s statements, the defendants’ lawyers wrote Thursday, show that there would be differences not only in the potential monetary claims that various potential plaintiffs would have in the case, but also that there would be differences in the claims of the named plaintiffs – who had varying degrees of prominence and played in different eras. The NCAA of course vehemently opposes class action certification and filed arguments stating that student-athletes voluntarily choose to play on broadcast TV and that choice is made without the legal need for a license for their appearance. They claim there is no evidence NCAA rules or forms are used to prevent former student-athletes from selling their name, image or likeness rights after graduation and that the plaintiff’s claim flies in the face of the First Amendment, publicity, and Copyright law. Recent uncovered emails have shown that NCAA representatives were well aware that players in games were based off real-life players. At one point the NCAA and EA had nearly reached an agreement to have actual player names included in the products. The EA Locker / Roster Share feature was a fallback option. With momentum clearly on the plantiffs’ side NCAA reps have begun to publicly express concern over the future of collegiate sports. 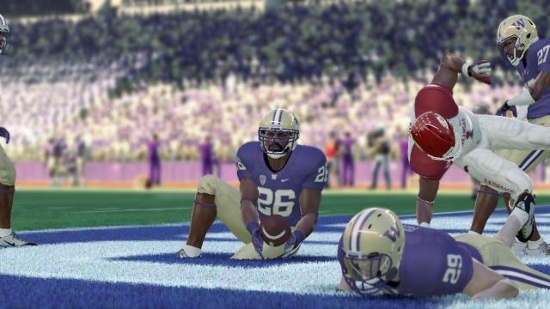 A former EA Sports producer admitted players in NCAA games were based off real athletes. The discovery of Tim Tebow’s name being in NCAA Football 10 could throw another wrench into EA’s series of arguments.